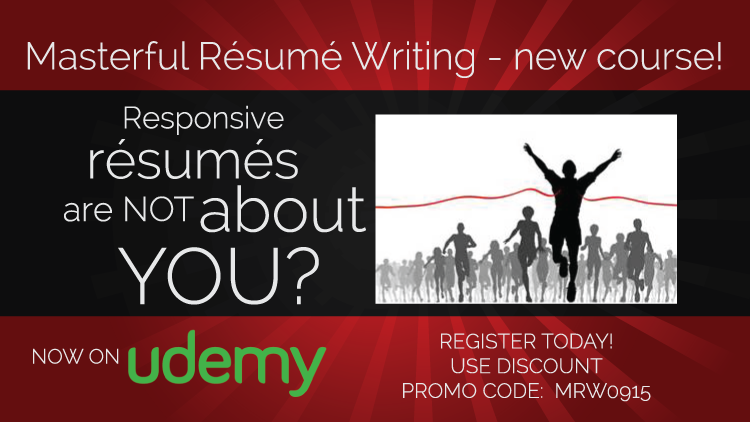 Resume Writing Course Now on Udemy! Resume writing is not obsolete – at least not yet! As long as employers are still requiring their submission with applications, you need to know how to write them! Are your resume writing skills up to par? Are your resumes getting you the response rate you want? If you’re not getting follow-through on your resume submissions, perhaps it’s time to take a fresh perspective on what you’re submitting. Sending in a boilerplate resume is no longer an option. To avoid being electronically “parsed out” of the running for a position, you must target your resume to employer need with specific keywords. Hey, listen. I really want to help you land the job of your dreams. And I know that when you’re on the hunt for a job, every dollar you have counts. To that end, I’ve decided to drop my course price to $10! For that small investment, you’ll learn to think of your resume in a new way. Look at it with fresh eyes. Find out what electronic parsing is and how it affects your perceived qualification for the job. Discover how to build on your strengths in the areas that will fill your prospective employer’s needs. You’ll learn to write resumes that help you make the interview shortlist. Courses on Udemy move at YOUR pace. You can take all the time you need to go through the lessons and build your first custom resume. Also, once you enroll in a Udemy course, you have lifetime access to the course and its materials – including instructor updates! So whenever you need to revise your resume, you can go through the process again! Enroll today and get started on your next career move! Click HERE to go to Udemy!